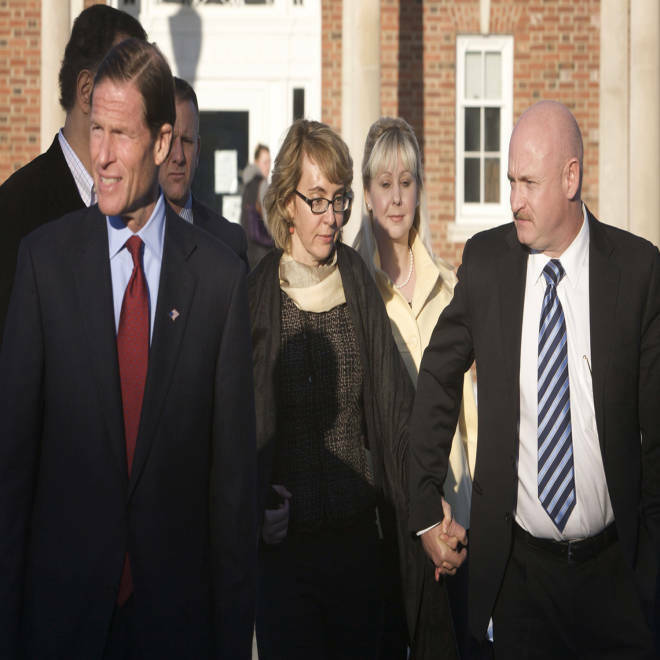 U.S. Sen. Richard Blumenthal, D-Conn., former Rep. Gabrielle Giffords and her husband, former astronaut Mark Kelly, leave the Newtown Municipal Building on Friday before heading to visit with families of the victims of last month's Sandy Hook Elementary School massacre. Former U.S. Rep. Gabrielle Giffords, who has campaigned for stricter gun laws since being shot in Arizona two years ago, is visiting the Connecticut town where a gunman with a semi-automatic rifle massacred 20 children and and six school staffers. Giffords, who was left partially blind by the 2011 attack at a campaign event, met with local officials at the municipal building in Newtown, Conn., Friday afternoon and was to see victims' families at a private home later in the day. "What drew her was the shared experience — our 26 victims and survivors, and what she experienced in Arizona," Newtown First Selectman Pat Llodra told the Newtown Bee. Sen. Richard Blumenthal, Lt. Gov. Nancy Wyman, and other local officials spoke with the ex-congresswoman about "what we as a society feel, what difference can we make given the horrific things that have happened," Llodra said. "We talked about gun control, mental health, and society's desensitization to violence," she said. "We need to use our voice to make a change ... We have to leverage that experience, and the world will listen to us, but we have to move quickly." Giffords was accompanied by her husband, astronaut Mark Kelly, who tweeted about the need for more gun control the day Adam Lanza carried out his bloodbath at Sandy Hook Elementary School. “20 - 5 year olds gunned down in their own classroom. When will we address this problem as a nation? The time is now,” he wrote. On Wednesday, Kelly and Giffords met with New York City Mayor Michael Bloomberg, founder of a group called Mayors Against Illegal Guns. Giffords was greeting constituents outside a Tucson grocery store on Jan. 8, 2011, when Jared Loughner opened fire, killing Arizona's chief federal judge and five others, including a 9-year-old girl. Twelve people, including Giffords, were wounded. Loughner, who used a 9mm Glock, has since pleaded guilty and been sentenced to life in prison. Giffords, who can't use her right arm and has trouble walking, resigned her House seat a year ago.